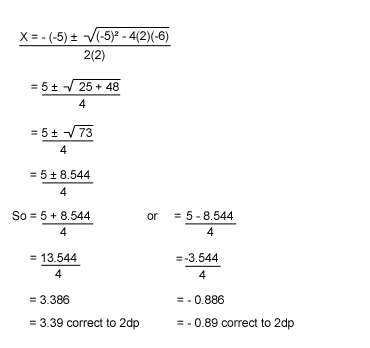 A quadratic equations is a polynomial equations of degree 2. The 'U' shaped graph of a quadratic is called a parabola. 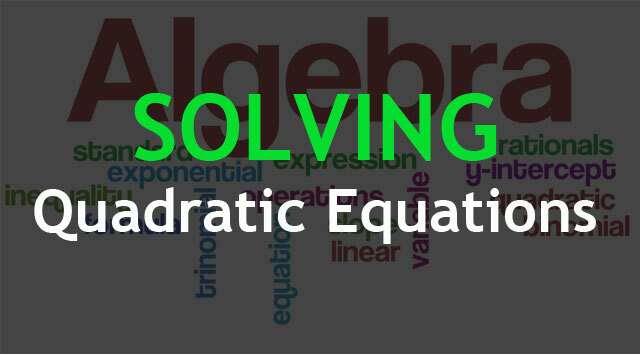 A quadratic equation has two solutions. Either two distinct real solutions, one double real solution or two imaginary solutions. If you want to know how to master these four methods, just follow these steps. All methods start with setting the equation equal to zero. Solve for x in the following equation: x2 + 6x + 8 = 0. This equation is already in the form "(quadratic) equals (zero)" but, this isn't yet factored. The quadratic must first be factored, because it is only when you MULTIPLY and get zero that you can say anything about the factors and solutions. You can't conclude anything about the individual terms of the unfactored quadratic (like the 5x or the 6), because you can add lots of stuff that totals zero. The solution to x2 + 6x + 8 = 0 is x = (–4, –2). Then the solution to x2 – 3 = 2x is x = (–1, 3). In this method, simple mathematical operations are applied to a quadratic equation (written in the standard form) in order to make its LHS (Left Hand Side) expression of the form a2 + 2ab + b2 . Then the LHS expression is factored to the form (a + b)2 by applying the above mentioned property. Solve x2 + 4x - 5 = 0 ! 2) Take half the value of the x-term or b (4). 4) Add the result to both sides. 5) Convert the left side to squared form and simplify the right side. 6) Take the square root of both sides. x = 1 and x = -5. This formula will work for all equations that can be solved. Solving quadratic equations by graphing step by step:Graph y= the left side of the equation or y = x2 -x-1 and graph y= the right side of the equation or y=0. The graph of y=0 is nothing more than the x-axis. So what you will be looking for is where the graph of y = 2x2 -x -1 crosses the x-axis. Another way of saying this is that the x-intercepts are the solutions to this equation. You can see from the graph that there are two x-intercepts, one at 1 and one at -1/2 . The answers are 1 and -1/2, These answers may or may not be solutions to the original equations. You must verify that these answers are solutions. Check these answers in the original equation. Check the solution x=1 by substituting 1 in the original equation for x. If the left side of the equation equals the right side of the equation after the substitution, you have found the correct answer. Since the left side of the original equation is equal to the right side of the original equation after we substitute the value 1 for x, then x=1 is a solution. Check the solution x = -1/2 by substituting -1/2 in the original equation for x. If the left side of the equation equals the right side of the equation after the substitution, you have found the correct answer. Since the left side of the original equation is equal to the right side of the original equation after we substitute the value -1/2 for x, then x = -1/2 is a solution. The solutions to the equation 2x2 -x -1 = 0 are 1 and -1/2.